Magic Everywhere by Eliza Frye Magic Everywhere, by Eliza Frye, is an eight page mini that deftly and silently mixes fantasy with reality. 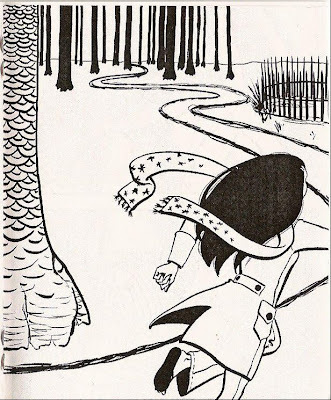 A young girl visiting a tar pits museum chases a snowflake and stumbles upon the skeleton of a mythical creature. Most of the eight pages feature two stacked panels, though page five, which serves as the "chase scene," is a full page panel. Eliza's art is simple and unadorned. She uses a nice balance of white space and black ink, and only draws what's necessary for the reader to get a sense of what is happening on the page. 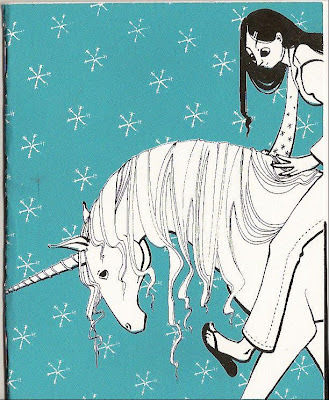 The cover, however, is a nicely detailed silk screened affair, done in blue and dotted with snowflakes. You can check out more of Eliza's work at her website. You can grab your own copy of Magic Everywhere at Eliza's online shop for $3 including shipping.